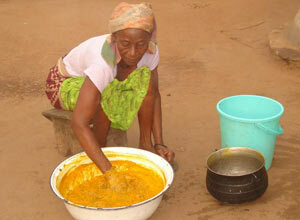 Ghanaian woman makes palm oil in the traditional way. 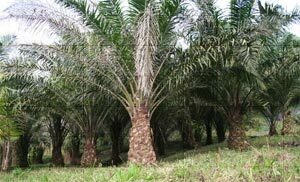 The oil palm provides two types of oil: kernel and palm oil. Palm oil is derived from the palm fruit. The plum-like fruits of the hybrid, Tenera, originally discovered in Central Afrika, contain the highest level of oil for any oil crop – ten times the amount produced by soya beans hectare to hectare. This is because edible oils are derived from both the fruit’s mesocarp and inner kernel seed. It was the immense industrial potential of palm oil that first grabbed the attention of Europeans during the Industrial Revolution and led to Britain waging war on West Afrika’s King Ja-Ja (Jaja) of Bonny to take control of his monopoly of the palm oil trade in the Niger Delta between 1870 and 1887. During this period, palm oil was crucial as flux in the tinplate industry and was the lubricant of industrial machinery. While Afrikans were using palm oil for lamp fuel it was the necessary fat source for making soaps and the indispensable candle during the Industrial Revolution. With the abolition of the trans-Atlantic slave trade palm oil became the leading ‘legitimate’ commodity exported from West Afrika in the middle 19th century. The Dutch were first to succeed in colonial Europe’s pursuit of the commercial viability in mass producing the oil palm. In 1910, with plants originating from a stock of West Afrikan oil palm seedlings sent to Java in 1848, plantation production first began in Sumatra, Western Indonesia and in 1912 in Malaysia. Today, Malaysia is the largest exporter of palm oil, followed by Indonesia. Palm oil has surpassed soybean oil as the most commonly used vegetable oil. The oil’s abundant essential fatty acid content (palmitic acid) remains semi-solid at room temperature, its non-drying quality, trans fat free characteristic and cheap pricing have made palm oil the most favoured solid fat ingredient for processing a multitude of edible products including baked foods, margarine, ice cream, mayonnaise and confectionaries, without undergoing the unhealthy process of hydrogenization. 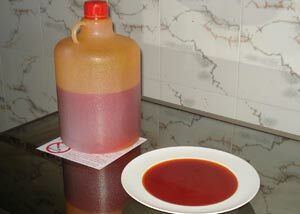 The bright red oil is also very good for frying at high temperatures without smoking or foul scent. Surprisingly, unlike many other foods that lose their nutrients when heated, much of the nutrients of palm oil remains intact after extensive boiling of the fruit to extract the oil. It is high in Vitamin E (tocotrienols and tocopherols), which maintains healthy, supple skin. Palm oil’s potent Vitamin E tocotrienols is described as a super-antioxidant that neutralizes disease causing free radicals—it has the highest level of tocotrienols among all vegetable oils. Could palm oil be secret behind Afrikans’ radiant complexion and renowned ageless features? The health benefits of palm oil are said to far out weigh the health risks, especially when blended with other healthy oils. In addition, no health statistic has revealed West Afrikans, whose diet for the past 5,000 years has included palm oil, are more susceptible to high levels of cholesterol or heart disease than any other population. A palm grove in Ghana. Indonesia is the leader in oil palm production but Malaysia surpasses it in palm oil export. In 2008, Malaysia exported 21.76 million metric tons of crude palm oil with revenue over $19 billion. Ghana made revenue of only $9.37 million from its palm oil export for that same year. China recently announced it would invest $21.6 million in Ghana’s palm oil industry to boost the country’s export to China to 36,000 metric tonnes for 2010. Perhaps in the future Ghana will eventually challenge Malaysia and Indonesia on the international oil palm market. The oleochemical industry is greatly dependent on the non-toxic and biodegradable crude palm oil for manufacturing a host of products such as textiles, cosmetics, ink, ointment, wax, paint and all forms of soaps and is quickly gaining an increasing edge over products derived from toxic non-biodegradable petrochemicals. Locally made palm oil soap is the only body soap I now use. It also doubles as my shampoo and lathers better than expensive brands. Melted shea or cocoa butter blends easily with the soft textured soap to provide a natural moisturizer without artificial chemicals or perfumes. The industrial waste from processing palm oil is used as manure and animal feed while the very processes of manually making palm oil and soup also provide functional non-edible by-products for locals. Section through the fruit showing ripe flesh and nutty kernel. Making palm oil manually requires boiled palm fruits first be pounded in a mortar and then macerated with water to extract palm butter (main pic above). The extracted butter is boiled and the ensuing rich oil is intermittently skimmed off the top. A thick oily residue accumulates at the bottom of the pot after all water has evaporated and oil removed. This nutrient-rich paste is added to soups and stews or often eaten with garri—farine. The remaining trash of fibre and kernels, which the Ewes call delă, are formed into large pad like shapes and sun dried. These extremely oily pads are used as tinder. The other oil generated from the oil palm tree is palm kernel oil, which is nutritionally and physically different from palm oil. Whereas palm oil is produced from the pulp of fresh, ripe palm fruits, palm kernel oil is extracted from the kernel seeds of the palm fruits. Traditionally, the seeds are dried, roasted, cracked and then ground. The kernel paste is boiled with very little water to extract the oil. Kernel oil looks similar to coconut oil and is lighter than palm oil. Like palm oil it is high in saturated fats but the fatty acids composition and properties of kernel oil are completely different from that of palm oil. It’s also much less healthier than palm oil at 80 per cent saturated fat whereas palm oil is 50 per cent. The oil is also used in food products but more so in the oleochemical industry for detergents, soap and toiletry products. The by-product of the nutritious kernel meal is also used for animal feed. Kernel shells are used locally as cooking fuel. More recently, palm kernel shell has been used as a coarse aggregate mixed with clay and bauxite waste to create pozzolana cement, a light weight concrete substitute invented in Ghana at Kwame Nkrumah University of Science and Technology. The cement is sold 50 per cent cheaper than regular cement. Another source of income has now been found in the oil palm tree – bio-diesel. In the constant global search for sustainable raw materials to generate an alternative energy source from petrochemicals, palm oil has already proven it’s a fierce competitor both environmentally and economically. In comparison to fossil fuels and biodiesel from other vegetable oils such as soya and rapeseed manufacturing palm oil diesel is cheaper because of the low production cost of raw material, the oil palm tree. Palm oil biodiesel provides excellent performance. It gives high ignition quality. Burning palm oil biodiesel does not generate carbon dioxide and therefore, it does not contribute to greenhouse gas emissions. Again, in 2008, Malaysia led in palm oil diesel export with 182,108 tonnes. The oil palm plant is also the leader for renewable fuel for its overall productive capacity. Fibres from the huge amounts of empty fruit bunches (EFB) fronds, trunk and the fruit mesocarp are biomass by-products that were generally abandoned as trash. Today they’re valuable by-products. EFB is used for mulching as organic soil matter and to augment moisture retention. Kernel shells and EFB are burned in boilers to create steam to generate electricity for large-scaled plants and ash from burning boilers is processed into another form of fertilizer that is cheaper than conventional inorganic ones and environmentally safer. Palm oil mill effluent (POME) such as sludge has been discovered to be an effective herbicide. POME mixed with fibre is used as flint. The research of oil palm biomass (cellulose) has shown great potential as a thickening agent for mixing with denatured ethanol for combustible gel or gelfuel. Tapping of palm wine also provides its own unique by-products. At the end of the approximately six-week process for wine tapping, the felled oil tree is finally left to rot. Rhinoceros beetles that generally bore holes at the base of trees’ fruit clusters to feed on sap, take advantage of the felled tree to lay eggs inside its decomposing trunk. The extreme rot of the tree provides the only form of food the beetle larvae will eventually eat. The fat white grubs, gbamido, are extracted to roast or fry as a delicacy. As much as I pride myself on having an ironclad stomach I doubted the Divinity of nausea would have come to my rescue had I attempted to appraise gbamido anymore than if I tried sampling the Chinese and French delicacy, frog legs—mountain or valley. But ‘bush meat’ is still not the last the rotted tree gives. After several weeks, with the onset of the rains, edible straw mushrooms (Volvariella volvacea) begin growing in hollowed area of the felled tree. Following the harvest of straw mushrooms another type of edible mushroom, Coprinellus disseminatus, grows in the felled tree. Schizophyllum commune, which are used for medicinal benefits, eventually grow at the base of the rotting tree. Along with edible products from the oil palm a slew of non-edible ones abound in Ghana, particularly household items. Weaved items from oil palm material are probably the most common oil palm product after palm oil and wine. Assorted baskets and various forms of sieves are made from palm rachis, fans for wafting fires, roofing ‘sheets’ and an array of mats are weaved from palm fronds. Spines of the fronds are made into brooms and kebab sticks while ropes are weaved from the trees roots and leaf fronds; skirts worn by initiates during Afrikania* ceremonies are also made from frond fibre. Oil palm rafters and lumber made from the trees’ rachis are typical materials for traditional house building. The villagers were in awe of my ‘adaptability’ to their local foods but after discovering one item after other made from the oil palm I was fascinated at the indispensability of the West Afrika oil palm tree to their households. Almost three years of living with the villagers much of their declaration of me as a yevu has slowly disappeared. They have accepted village life in Volta Region is home to me just as my native St. Lucia. Palm wine has surpassed my liking for Irish Cream and palm nut soup, particularly when a day old, is giving my penchant for groundnut soup a serious contest. Perhaps such affinities are in the structure of my West Afrikan genetic psyche and give credence to Walcott’s, how can I turn from Africa and live? Special thanks to the staff of the Oil Palm Research Institute-Ghana, particularly Mr. Armah Saba; Mr. Erasmost Eshine from Ghana Export Council and also to R. Kwashie Yinkah. * Preferred term for Afrikan Traditional Religions by adherents of the spiritual form typically called ‘vodun’ or ‘vudu’. What an amazing, extensive piece of research.